The Simnel cake is a truly traditional British cake – and can be a wonderful Easter treat when baked following a sugar free recipe. A spicy, fruit cake, there are a number of different ways to make and decorate it, depending on individual taste and just how much fun you want to have with the topping. Simnel cakes have apparently been around since the Middle Ages and used to be taken home by girls in service on Mothering Sunday. Recipes traditionally include a great deal of dried fruit within the body of the cake and then marzipan or almond paste on top. Many also have marzipan or almond paste baked insideToppings traditionally feature 11 marzipan balls (or Easter eggs), which represent the apostles. Judas is not included. This sugar free Simnel cake is a heavy, fruity version. It uses honey instead of sugar and includes a sugar free marzipan. Preheat your oven to 150 deg C/140 deg C/gas mark two. Then, to make your marzipan, melt your two tbs of honey in a small pan over a low heat. Put your ground almonds into a bowl. Beat your egg then add to the almonds. Slowly pour in your runny honey and almond essence. Mix until smooth and able to be rolled out. Place in the fridge to chill. Melt your cake honey and butter in another small pan over a low heat. Place flour, salt and cinnamon in a large bowl. Beat your eggs and mix in. Add the melted butter and honey to the mixture, then your dried fruit and peel. Grate the zest from your lemon then add that too. Grease and line an 18cm (seven ins) tin. Take your marzipan from the fridge, roll out and cut into two circles the size of the tin – save the remaining pieces. Spoon half your cake mixture into the tin then place one of the circles on top. Spoon in the rest of your cake mixture. Bake for approximately 90 minutes until cooked all the way through. Take out and leave to cool - but do not remove from tin. Cover the top of your cake with sugar free jam. Place your second circle on top. Roll your remaining marzipan into 11 balls, place them round the edge of the cake, brush with beaten egg then place in the oven with just the grill setting on until marzipan is brown. Remove and allow to cool again. 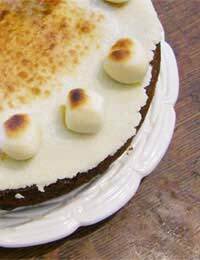 This sugar free Simnel cake calls for artificial sweetener. Another fruity variety, it can be decorated with sugar free chocolate eggs. These are available now in a number of stores and supermarkets. Look for the diabetic eggs and chocolate.Alternatively, some premium chocolatiers now make small Easter eggs with such a high cocoa content that very little sugar is actually present in them. And why not try organic varieties too? Preheat your oven to 150 deg C/140 deg C/gas mark two. Mix your granulated sweetener in a bowl with your ground almonds. Add beaten egg and almond essence to make a firm paste that can be rolled out. Place in the fridge to chill. For your cake, beat your margarine and sweetener together until creamy and light. Add your beaten eggs. Once mixed in, add your dry ingredients and fruit. Grease and line an 18cm (seven ins) tin. Again, place half the mixture in the tin. Remove marzipan from fridge and cut into two circles the size of the tin. Place one of these over your mixture. Then spoon in the rest of the batter. Bake for 90 minutes until firm to the touch. Remove from the heat, allow to cool. Reheat your oven to about 180 deg C/350 deg F/gas mark four. Brush the top of your cake with sugar free jam and place second circle on top. Bake quickly again for ten minutes until brown. Allow to cool, remove from tin and place 11 colourful Easter eggs on top.